Accompanying note: "At a 7/17 news conference, Rev. Martin Luther King, Jr., threatens renewal of racial demonstration because of a 'lack of desegregation progress' here. 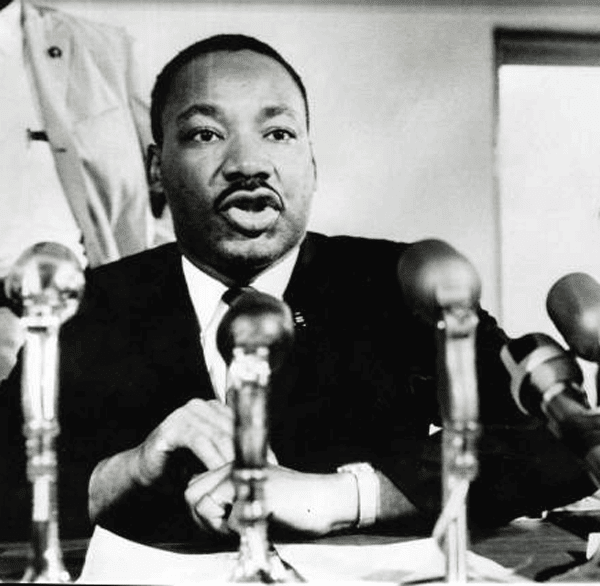 King flew here to appraise the racial situation and then returned to Atlanta." 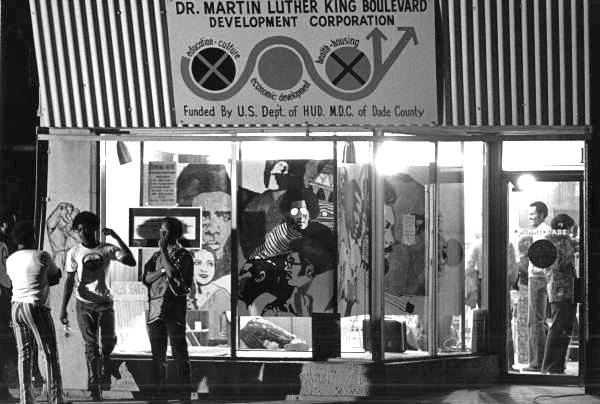 All photos and information today on Dr. Martin Luther King is from Florida Memory — State Library and Archives of Florida. "On April 4, 1968, James Earl Ray assassinated Dr. Martin Luther King, Jr., civil rights activist and Nobel Peace Prize winner, in Memphis, Tennessee. In the ten days following this tragic event, riots erupted in over one hundred American cities. Up until this time, social scientists believed all rioting occurred in response to local events or dissatisfaction. This assassination proved that black awareness extended further than home boundaries. The rioting afterwards 'was the first time that [Black] collective disorder was set off in response to a single, politically significant national event.'" Reverend Charles Kenzie Steele was born on February 17, 1914 in Bluefield, West Virginia. He moved to Tallahassee in 1952 and started preaching at the Bethel Missionary Baptist Church. 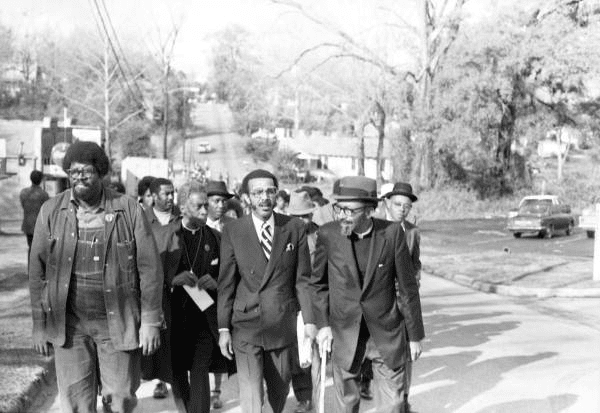 Reverend Steele was one of the main organizers of the Tallahassee bus boycott that began in May 1956. He also helped Dr. Martin Luther King Jr. organize the Southern Christian Leadership Conference in 1957. 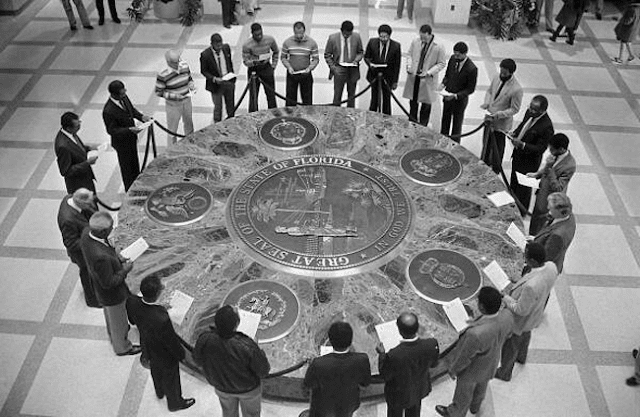 Men gather around the Florida Seal to honor Dr. Martin Luther King : Tallahassee, Florida January 20, 1986. Accompanying note: "Black businessmen, students and ministers surround the Florida seal here Monday as part of a local ceremony to honor Dr. Martin Luther King for the King holiday remembrance celebration." 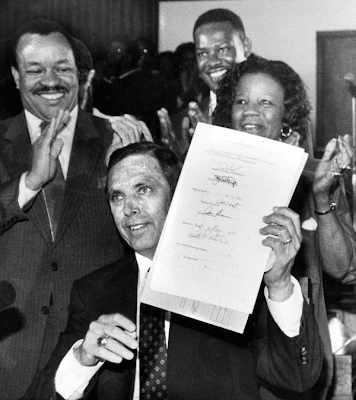 Governor Robert "Bob" Martinez signing Dr. Martin Luther King Jr. holiday measure into law in Tallahassee, Florida. May 31, 1988. Also today I would like to honor the victims of the earthquake in Haiti by sharing with you a bit about our Haitian community in Florida. The Civil Rights Movement and Dr. Martin Luther King surely affected their lives, as much as that of African-Americans. Rara is a celebration that follows Carnival in Haiti. A Rara band consists of a wide range of percussion and wind instruments, and may include rattles, conch shells, and "found" instruments such as car springs. 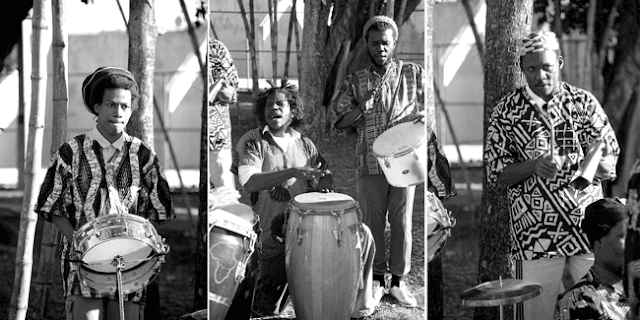 The group was performing at Martin Luther King Park in Miami. Haitian Flag day is a patriotic celebration for many Haitian Americans. Here, two educators Josue Derival and Nancy Aubourg supervise the celebration at Boynton Beach High School. The celebration drew a crowd of more than 500 and included dinner, speeches, student and professional performances. Haitians of Florida is a photographic exhibit documenting the growing Haitian population in South Florida and their participation in South Florida daily life. Developed by Joe Bernadel, co-founder of Toussaint L’Ouverture High School for Arts and Social Justice (TLHS). “Haitians of Florida” is partially funded by a grant from the Palm Beach County Cultural Council to two Artists-in-Residence, Michiko Kurisu and Jerry Lower. Their work, and that of their high school photography students may be viewed at the exhibit’s current location, or in the online Gallery. This post gave me goosebumps... I wish more people would realize that we all have the potential to be amazing. To be leaders. To change the world. Dr. King was an ordinary man, but he had extraordinary courage... and extraordinary faith... and because of that, he accomplished extraordinary things. I am so grateful to the men and women throughout history who have taken chances, who have walked where others were fearful to step and blazed a trail. They amaze me. They leave me in awe... but best of all, they inspire me to try changing the world. If we all just gave it a try... imagine the world we could have. You did a great job with this post. I think it is easy to forget the past, I appreciate the reminder. thanks for taking the time this beautiful post. loved looking at all the historic moments and how you tied it to the Haitian community. A beautiful post. I agree with KS...all it takes is ordinary people with extraordinary courage. We should all be brave enough to follow in his simple but oh-so-powerful footsteps.